Do you make jewelry but you don't have a jewelry bench? Or do you need to make jewelry on the go, at a show, and wish you had some of the basic comforts of a bench? Well, here's a couple of ideas I'd like to share. There are lots of kitchen table jewelers out there (I guess I should know, since I wrote: Soldering Made Simple: Easy Techniques for Kitchen Table Jewelers in 2010 ). Your average table is too low for sawing and filing. The bench pin should be level with your sternum for that kind of work, or you risk back and neck pain. Having the bench pin closer to your eyes makes it easier to see what you're doing, too. When we travel to teach often the tables are very basic and too low. On the last trip to teach at Alaska Bead Company in Anchorage, I worked at the wrong height, and I was in pain after just a few days. So I grabbed a spare box/drawer from a small Ikea cabinet. 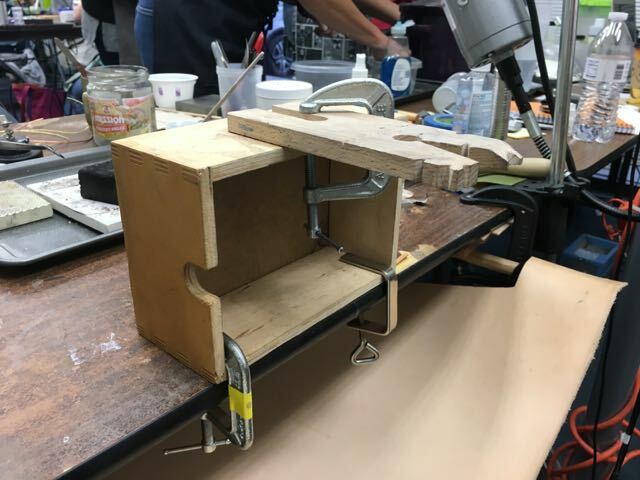 I clamped the box to the table top and then clamped the bench pin to the box. Even with an adjustable office chair, the box made all the difference and my back feels great. Very light for travel. By the way, this is a v-slot bench pin that comes with a clamp. But I find when I use a real c-clamp it doesn't move as much from side to side. I used the clamp that came with the pin to help clamp it to the table. Another trick would be to screw the bench pin to the box to make it more secure. The other thing I miss when I'm traveling is my sweeps drawer. It kills me to drop precious metal dust and scrap onto myself and the floor - what a waste! And then there's all the bits and tools that fall off the table, too, that used to get caught by the drawer. After a little brainstorming, I came up with a leather sweeps bag to attach to the table (ignore the chaos on the floor, please, but at least you know this was really used away from the studio!). The parts were easy. I found some inexpensive leather (luckily the location where I was teaching was next door to Tandy Leather). You could even buy a cheap leather garment and recycle it into your new bench bag. Hmm, maybe a use for those tragically depressing leather pants in the closet? And if it's a coat, as Charles Lewton-Brain points out in his fantastic must-have book The Jewelers Bench Book, you can sew up the sleeves to make handy tool holders. 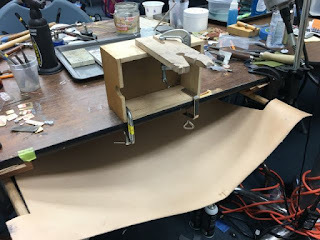 I cut the leather down to the size I wanted, with a straight front, and cut out sections on each side to make tabs to hook around the dowels. Now a trip to the hardware store. I bought a dowel and cut it to size for two pieces 18" long each. I could only find a round dowel. Square would be much easier to clamp. I wrapped the last 3" of each end of each dowel with velcro tape. I put the other half of the velcro tape on the back side of those leather tabs I cut out. Then I clamped it to the table with a couple of 4-6" c-clamps. I stuck the tabs onto the dowels. They stayed, and the connection was tight. Step one complete. Total cost: less than $25. 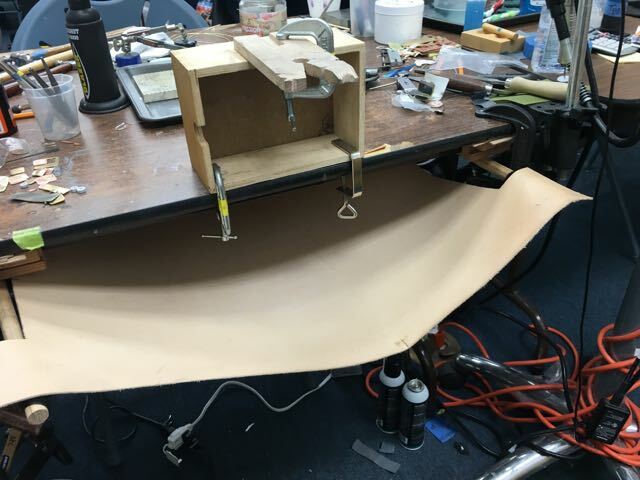 Clamping the dowels under the table gives the bag support and let's you adjust the tilt to hold the sweeps. This table has a metal frame underneath, so I cobbled together some quick spacers for the clamps to hold properly. When I snap the middle of the leather bag lightly downwards, it funnels all the dust into a neat pile for easy sweeping into a container. This may seem a bit MacGyver for some, but I love it and it was a big smile-making difference in my work and comfort. Of course, you can make better or prettier versions for a home jewelry studio that uses a standard table. In fact, you can get a bench pin with a metal frame to raise its height. And some students use a bench vise to hold the bench pin (hey, and it swivels out of the way, and it has a built in anvil, and it's... a vise!). Another idea I've seen used for a sweeps drawer is a under-the-table keyboard tray. Of course, you want anything for sweeps to be low enough that you still have room to comfortably saw and file, and high enough to sit just above your thighs when seated. I'm sure you could find a couple of pieces of wood to use as spacers to adjust the height. Hopefully these tricks are helpful for our students at Silvera Jewelry School, when they want to set up to practice at home. Awesome! I'm just outfitting a new studio and will definitely use some of these ideas!